It’s All About the Cupholder! For the past month I have had the distinct honor of serving as Lebanon, Indiana’s Fourth of July Celebration Grand Marshal. Yesterday, on the Fourth of July, I had the pleasure of being chauffered in the parade by someone I consider to be a great friend, mentor, and coach; Kevin Eikenberry. Kevin and I love to spend time together visititing about the latest technology, building learning organizations, the similarities of business and education, and about agriculture. One of Kevin’s passions is antique tractors. 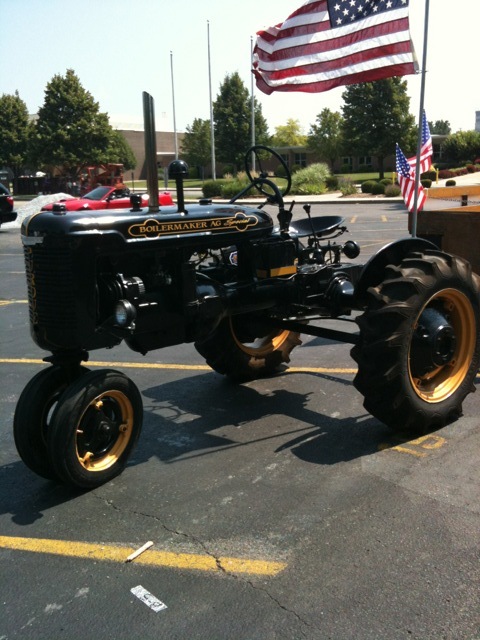 Therefore it was appropriate, I thought, that I ride in his wagon being pulled by his Farmall BN that he has painted to match the Purdue Boilermaker Special and has appropriately named the Boilermaker Ag Special. Let me give you one more detail that is important for you to know to really get a grasp on how special it was for Kevin to do this. 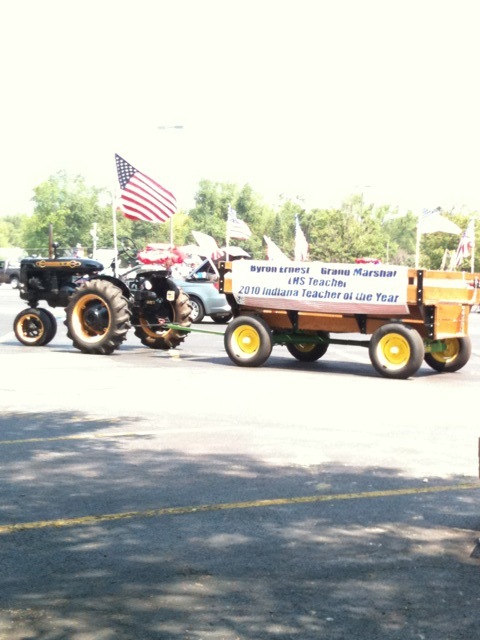 He had to drive to Michigan and get the tractor and bring it home to use in the parade. Now that’s friendship! Here is the important part of my post. You cannot imagine how much I was looking forward to hooking up with Kevin yesterday morning to help unload the tractor and wagon. It really was not about being Grand Marshal, it was about spending time with Kevin. And our time started just like any other time we get together – like two ducks that have been apart we chattered, laughed and poked fun at each other. Then we got ready to drive from our staging area to the parade line-up I saw Kevin fumbling with his bottle of water, and I said, “Dude, you need a cupholder.” Then, everything ceased and we proceeded to determine where the cupholder needed to go, and who he knew that could fabricate it! So, the point of this post is to point out WHY it is so important for us to have friends, mentors, and coaches. It’ about finding our cupholders – It’s all about the WHY! Simon Sinek talks about this in his book Start with Why. He talks about how the German car engineers thought that selling cars to Americans was all about the engineering, but then they found that we are obsessed with cupholders. We must know our WHY. Let me conclude by saying what an honor it was to be selected as the Grand Marshal, and what a thrill it was to represent my school, Lebanon High School. Hopefully I have my WHY in check with my personal mission of, striving to be a steward of high student acheivement by using rigor, relevance, and relationships while collaborating and gaining the trust of my colleagues. Our principal, Kevin O’Rourke, always stresses “Students/school before self.” This is a pretty important WHY from someone I greatly respect! What a day it turned out to be as we rode the parade route with friends, colleauges, students, and others giving me shout-outs. Addtionally, all of the Purdue fans giving us “Boiler-ups” as we passed in the Boilermaker Ag Special. I was humbled, because I realized that without Purdue, a great school, awesome students, an incredible wife and son, wonderful teacher colleagues, visionary administrators like Mr. O’Rourke, and the greatest friends in the world like Kevin Eikenberry, the Grand Marshal honor would have never happened. The WHY was really not about me at all! Thanks Kevin for always helping me find my cupholders, and I can’t wait to see yours on your tractor!